Hurricane Maria strengthened into a "potentially catastrophic" Category Five storm as it barrelled into eastern Caribbean islands still reeling from Irma, forcing residents to evacuate in powerful winds and lashing rain. 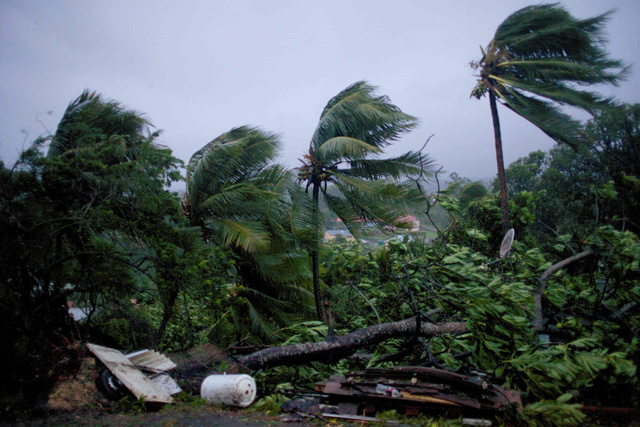 The maximum-strength storm made landfall on the Caribbean island of Dominica around 0115 GMT Tuesday with top winds swirling at 160 miles (257 kilometres) per hour, the US National Hurricane Center (NHC) said. "Dangerous" storm surges, destructive waves, flash floods and mudslides threatened the Leeward Islands - the island group that includes Martinique, Puerto Rico and the US and British Virgin islands - the NHC said. 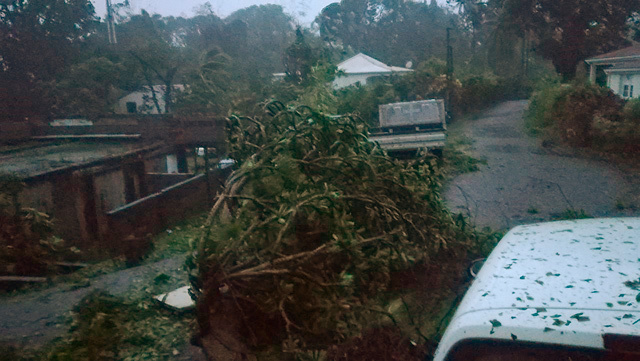 The center earlier warned that "preparations to protect life and property should be rushed to completion" as the eye of the storm approached Dominica. Guadeloupe - the bridgehead for aid for Irma-hit French territories - ordered all residents to take shelter in a maximum-level "violet alert" effective from 8:00 pm as powerful rains drenched the French Caribbean island. In Dominica, Prime Minister Roosevelt Skerrit said his roof had been blown off, his house was flooding and he was "at the complete mercy of the hurricane". "Rough! Rough! Rough!" he wrote on his official Facebook page, later adding that he had been rescued. The island's airport and ports have been closed, and the local water company shut down its systems to protect its intake valves from debris churned up by the storm. "Just ready to ride out storm at best. With a little prayer on the side," she said. The hurricane was expected to pass 30 km south of Guadeloupe, with the height of the storm expected at 3:00 am. "Everyone must remain inside, and not venture out for any reason," said the island's prefecture authority. Irma, a Category 5 hurricane, left around 40 people dead in the Caribbean before churning west and pounding Florida, where the death toll stood at 50 Monday.